Comments: Eastern woodrats resemble a large mouse and are grayish-brown with a white throat, belly, feet and a furry tail. They build their nests in rock ledges, tree bases, brush piles, fencerows, old buildings and abandoned vehicles. Typical nests are cone-shaped, 4 feet across and 3 feet high. 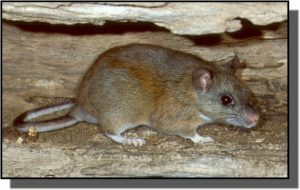 Due to their habit of storing small "treasures" in their stick nests, woodrats are often called "pack rats." These treasures might include shiny bottle caps, pieces of colored glass and empty shotgun shells. Two litters of 3-4 young are produced between February and September. Maximum longevity is 3 years. Distribution: Eastern woodrats range from the southeast to the mid-central United States. They can be found in woodlands throughout Kansas. Food: Eastern woodrats feed on buds, leaves, bark, nuts, fruits, berries, forbs and dry mushrooms.